Geneviève Keola Brunet (1970) has been practising bodywork since 1998. She started out with rebalancing massage and chairmassage. In 2004 she became interested in Craniosacral Therapy and she started her training in CST. After feeling and noticing the immense possibilities of this powerful therapy, she completed the whole education in several years and specialised in Craniosacral Therapy. She has been practising this deep work ever since. Having moved from Europe to Hawaii three years ago, she became a Licensed Massage Therapist as well for the State of Hawaii. 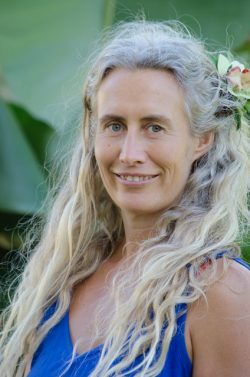 As she always has been interested in the communication field between body, mind and spirit, Geneviève Keola deepened her skills and knowledge on this path. Throughout the years she specifically trained herself in listening deeper and deeper to what the body wants to tell. Personally, out of her interest in dance, consciousness, a deeper connection and clarity, she moved in different fields. She has been practising and teaching Gurdjieff movements for many years. These are movements for inner alignment and centering, brought to the west by G.I. Gurdjieff (1866-1949). Besides that Geneviève Keola dances Argentinian Tango and also Hula since she moved to Hawaii. She also practises meditation, yoga, mindfulness and dancing in the Hawaiian ocean while snorkeling. And she loves playing Ukelele and sharing music and dance with her husband in different groups. “In all the fields I move I am always amazed by all the journeys we can make within the body. When we go deeper inside we connect with this infinite space of inner wisdom, when we dare to listen to all the subtle messages our bodies want to tell us”.